Chocolate, It's what I turn to in times of sadness and the first thing I look for on the dessert table. Preferably, nestled between 4 cake layers. As the band plays that first wedding song, people gaze along in admiration as the bride and groom sway to the music, you'll find me with that same glossed over look as rivers of chocolate pour from a odd shaped fountain over my wooden skewer impaled fruit. 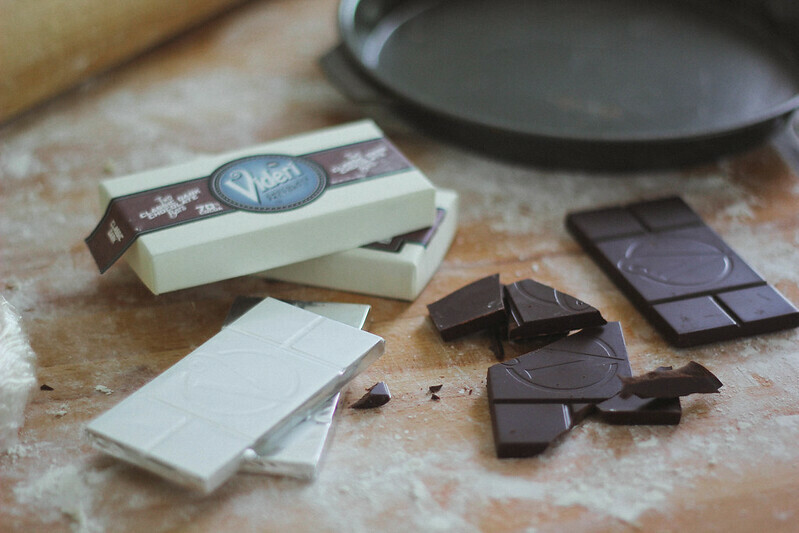 To sum all that up, I like chocolate..
Videri is a bean to bar Chocolate Factory, using the finest organic cocoa beans and cocoa butter available, they’re doing some impressive things with chocolate, starting with a pink peppercorn bar I just couldn't get enough of. 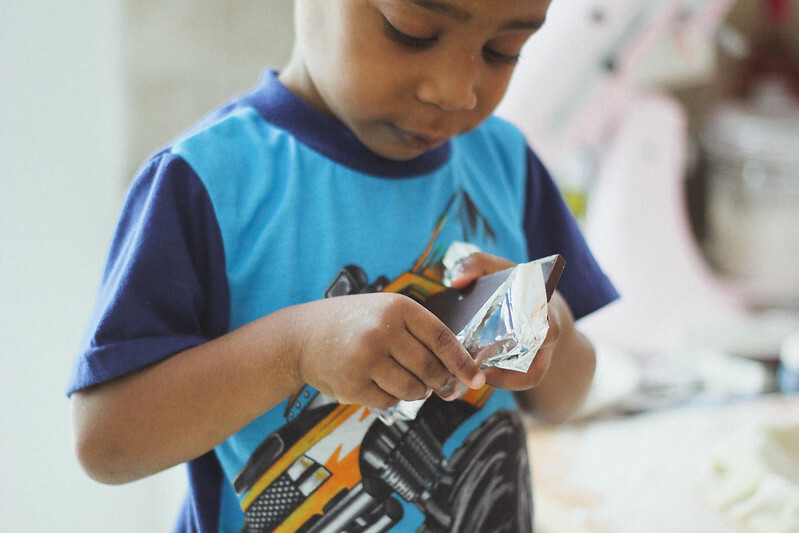 Located in Raleigh North Carolina (my hometown), Videri is a full out chocolate factory, where you can roam their space while taking in all the gloriousness that comes along with watching the process of making chocolate, while learning how they source fair-trade ingredients. Then shop the shelves for all kinds of chocolate confections.. As well as grab a cup of coffee. 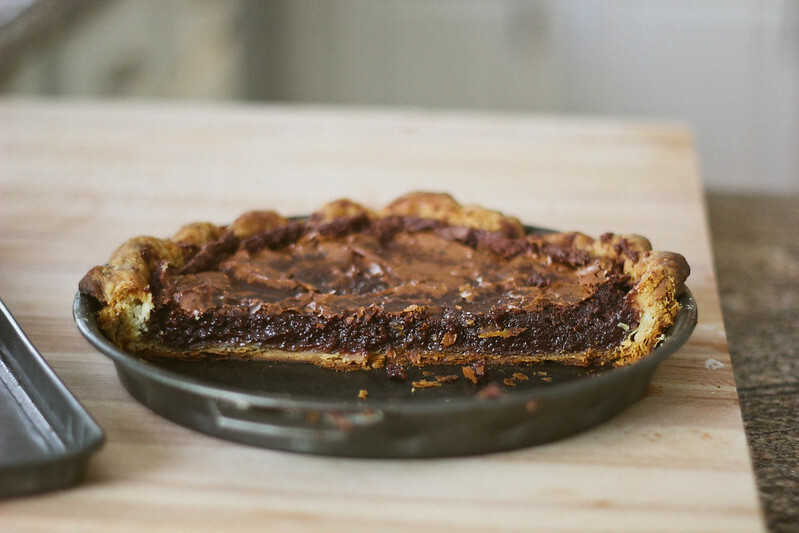 Here I've used their Classic Dark Chocolate to create this dreamy pie that's the equivalent to a fudge brownie lying in a bed of flaky pastry dough. 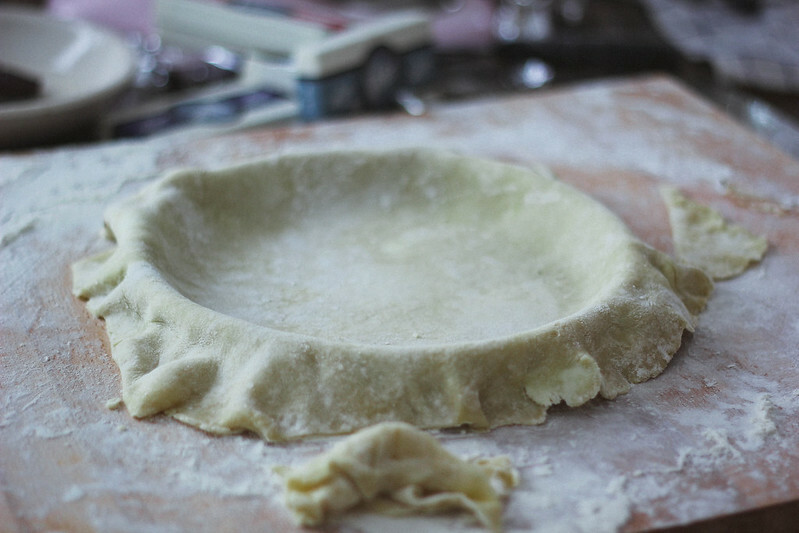 Pie Crust: In a large bowl, combine the flour and salt. Cut in the butter (mixture should look like crumbles). Stir in the water about a tablespoon at a time until the dough comes together. Wrap dough in plastic and refrigerate for atleast 2 hours (or overnight) Preheat oven to 350 On a floured surface, roll out the dough to fit your pie pan. Center dough in the pan and trim the edges, leaving about ½ inch over hang around the sides. Fold the over hang under the rim and crimp the edges. Put the crust in the freezer for 10 minutes. After removing the crust from the freezer poke holes at the bottom of the crust using a fork. Line the crust with parchment paper (you can also use foil) and fill with pie weights to cover the bottom and along the side of the pie. Bake for 15 minutes with the pie weights . Remove from the oven and allow to cool. Remove bowl from stove and whisk in the sugar, eggs, vanilla and salt until combined with the melted chocolate. Slowly pour in the cream, whisking until the mixture is smooth. It truly looks like a bowl of pudding but it's not so don't eat it yet. 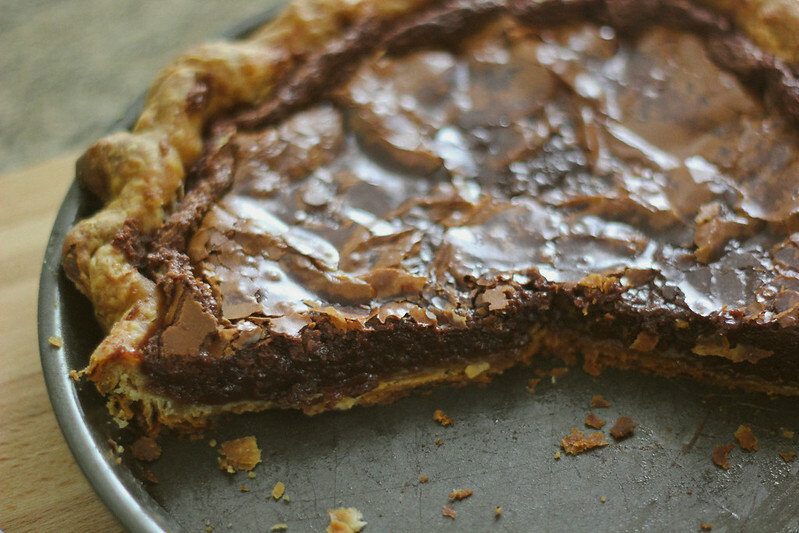 Pour the filling into the pie shell, place the pie on a baking sheet and bake for 40-45 minutes. The top will crackle on the top like a pan of brownies.. This is a good thing.. A really good thing. Remove from the oven and allow pie to cool before slicing. I try slicing it way too early and it was troublesome getting it out of the pan. 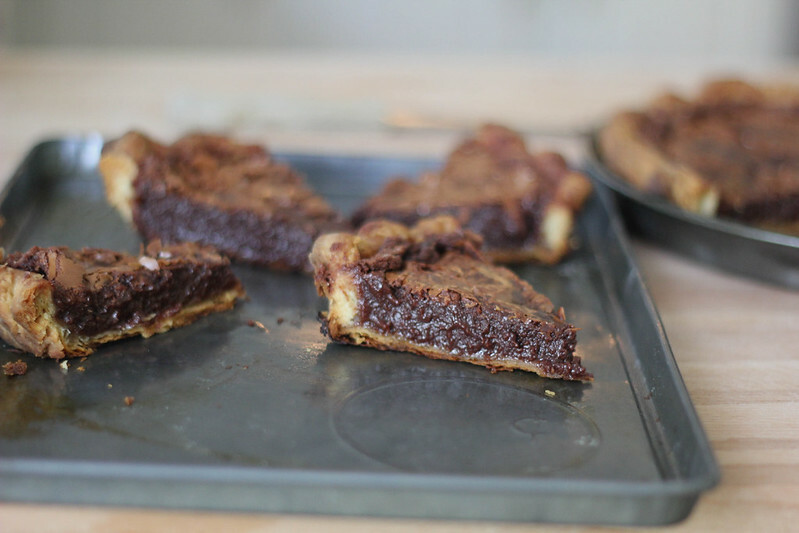 *Note: if the edges start to brown too quickly, cover the crust with strips of foil.